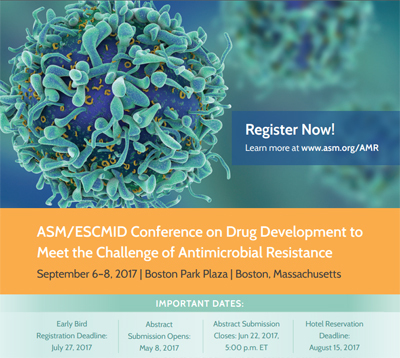 ASM and ESCMID are going to organize an international meeting on the topic of antimicrobial resistance, to be held Boston, from 6 – 8 September 2017. The early-bird registration deadline for the ASM/ESCMID Conference on Drug Development to Meet the Challenge of Antimicrobial Resistance (AMR) is 26 July 2017. Co-sponsored by the American Society for Microbiology (ASM) and ESCMID, this leading conference will provide a unique forum for you to explore the challenges, opportunities and current requirements for antimicrobial drug development to tackle AMR. For other recent ESCMID news, click here.